I came across Superdrug's Vitamin E - Hot Cloth Cleanser and the game has officially changed! I've been using this product religiously for over 2 weeks now and I am officially a convert. It's time for me to to say goodbye to my regular online purchases and switch drugstore! I'm not mad though because Superdrug's hidden gem has be saving over £10 for the product and it's an absolute steal for only £4.99!! Similarly to the Liz Earle Hot Cloth Cleanser, the Superdrug dupe comes with both a cleansing product and muslin cloth. The procedure is pretty much the same. You distribute the product all over your face, gentle massage it in and after running the cloth under hand-hot water use it to wipe away all traces of dirt and make up. If I had to choose between the two I would say Liz Earle provide you with a softer and more gentle muslin cloth so I often opt to use the Superdrug cleanser with the higher end cloth. I feel Superdrug's cloth can sometimes feel too stiff and harsh on your skin and really needs to absorb the water to give the best results. The consistency of the Vitamin E range is similar to that of Liz Earle, if not slightly thicker. The white, creamy texture is such an ease to work into my skin in no time at all. Smell wise, the Vitamin E Hot Cloth Cleanser has a slight "sunscreen-y" smell which isn't my favourite but nothing too overwhelming to get over. Packaging wise, I have to admin the Superdrug version has to be a winner for me. As much as the sleek long bottle by Liz Earle looks great along side all my skincare products the squeeze tube by Superdrug really does help me get my money's worth! It's difficult for me to give a decision on which product provides the best results because both are almost identical. After use of both products my skin is left feeling clean, fresh and softer. I did reach for Liz Earle during some moments of serious breakouts and dry skin and it worked a treat to restore my skin to it's natural state, so as my skin is behaving right now my dupe isn't being truly tested on it's ability to provide life changing results. Finally, it goes without saying but price wise Superdrug have to get a huge shout out. For only £4.99 you get a 200ml tube AND a muslin cloth which is an absolute bargain! I'm sure Superdrug are also doing Buy 1 Get 1 Half Price on their own branded products at the moment so it's the perfect time to get your hands on some goodies! I'd also recommend the Vitamin E Dual Phase Cleansing Oil as a follow up treatement to the Hot Cloth Cleanser. The cleansing oil has also found it's way to my everyday make up routine and I use this both in the morning after washing my face and right before bed in the evenings. It helps pick up any lasting dirt or traces of make up and just adds a slight glow to my skin. Overall I am a huge fan of Superdrug's Vitamin E range so far and am excited to pick up a few more products to add to my collection. 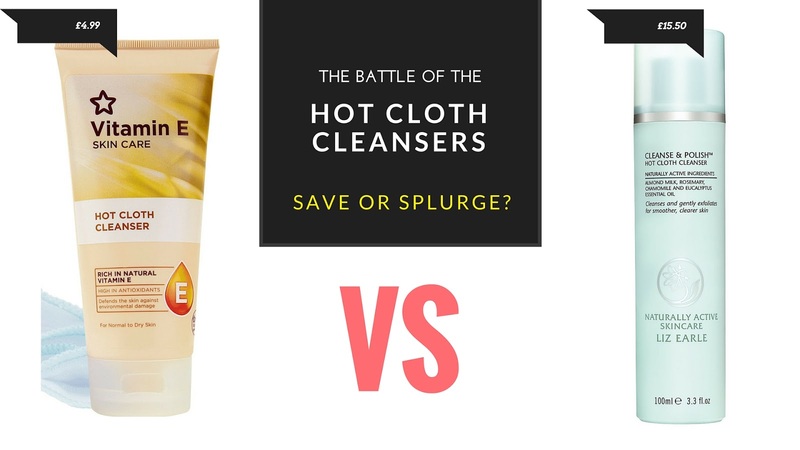 The Vitamin E Hot Cloth Cleanser is such a great dupe for the Liz Earle Hot Cloth Cleanser and you could SAVE over £15 by switching to the drugstore version! Have you tried out either product? Have any other skincare dupes to share? Let me know below!! I've run out of my Liz Earle cleanser and was thinking of repurchasing.... I might give the superdrug one a go instead now!